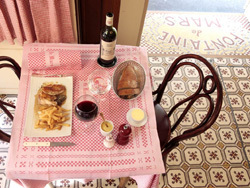 The best way to learn French is on a French immersion course in France. 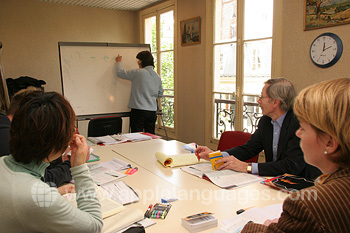 On an Intensive French course at our Paris (Louvre) school, students learn the French language in classes with a maximum group size of just 6 students. This small group size is ideal if you want to learn French fast, learn as much French as you can as quickly as possible, or simply make rapid progress with the French you already know. A French immersion course at our school in Paris gives you the opportunity to explore Paris at the same time as you learn French. Our Paris (Louvre) school is in the best possible location, in the very centre of Paris, half way between the Opera and the Sacre Coeur, and just 15 minutes’ walk from the world-famous Louvre Museum. 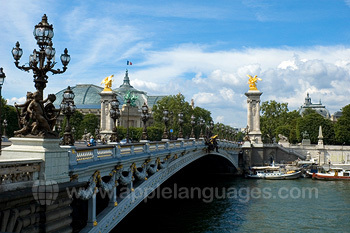 It is also possible to follow an Intensive French course at our school Paris (Arc de Triomphe) and Paris (Opera). 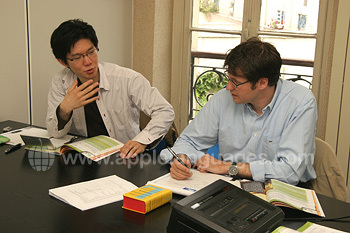 Our Paris (Louvre) school occupies all three floors of an ‘Empire period’ detached villa in the centre of Paris. The school has 12 classrooms, a student common room with terrace, language laboratory, television room and Internet room with wireless access. The Standard French course (20 lessons/week) and Intensive French course (40 lessons/week) both offer total immersion in the French language, with a maximum group size of just 6 students per class. Every lesson is taught entirely in French. You can also take a ‘Combined Course’, combining group lessons with 10 private lessons/week. The small group size ensures that students learn as much French as possible in each lesson. 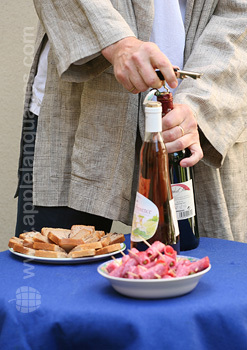 Our school Paris Option 3 also offers a ‘savoir-faire’ course on French etiquette – the best way to learn the ‘do’s and don’ts of French culture. The school also runs an intensive weekend French course, with lessons taking placing over Saturday and Sunday, including lunch with your French tutor and providing total immersion in French. 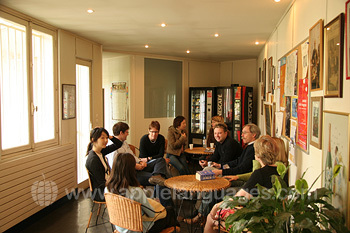 Our school in Paris recommends that you stay with a French host family where you can practice the French you learn at school. Although our Paris Louvre school does not offer activities, our colleagues would certainly be pleased to offer advice to assist you with arranging some activities yourself! Average score for our school in Paris (Louvre) based on 28 previous client reviews. I really enjoyed the course. The teachers were all brilliant, I liked having a variety of teachers because they each had a different style. The accommodation was really good, we were looked after very well, I felt like part of their family. It was great to be able to practice my French with them in the evenings, and to see how a French family live. The course was excellent, the teacher fantastic and the location brilliant. A real success, many thanks. The course was very good. I enjoyed the small groups, as you really have to speak French a lot. The emphasis is mainly on speaking, with a bit of grammar when neccesary. I was happy with the course and would recommend it. The course was very good, and the teacher had a lot of patience with me. I loved the course, I'd never conversed fluently in French for that length of time before, and I was so surprised I could do this. The school itself was lovely, and the staff was great at sticking to a total immersion approach. The course was very good and aimed at the older student which meant that the class discussion was more interesting, The small class sizes are a fantastic idea and the teaching was very focused with attention paid to what students wanted and required. The individual classes were also well structured and all members of staff really made an effort to welcome students and to look after them. The extra curricular activities (cooking class, wine class) were also very well done and organised. All in all a great week! Absolutely excellent - the teachers were keen and dedicated, and the lessons well-planned and managed well between the different teachers. Lovely apartment with a lovely couple, who welcomed me into their life for two weeks. As a mature student Option 3 met my needs exactly. It really was quite intensive and therefore tiring, but that was exactly what I was looking for - a final boost to my French before my finals! The staff at the school were great. My host was lovely and even gave her bed up for me for a week as she usually only accepts one student! If I'm honest, I was that busy that I barely saw her, but whenever our paths did cross she was always checking that everything was ok and that I wasn't in need of anything. And to finish it all off, she lived in a really cute Parisian flat! My experience there was made all the more positive because the students try to speak in French outside of the classes as much as possible too. In the past I have been to other language schools where English reigns supreme and that is certainly no help to me at all! My confidence was brought on so much more just in one week because of all the practise! The course was of a high quality, particularly in the afternoons. The morning classes were slowed down a bit by less able students, but the teacher gave me extra work. My accommodation was good and I shared the bathroom only with one other student, so that was excellent. The family was really nice, we had a lot of freedom and they learned me lot about Paris. The teaching was excellent and the group size was never more than 5. Students were generally of a similar standard in the group and got on very well. The staff were very professional, motivated and friendly. My host family werevery hospitable and it was very convenient for the school. The school was very accommodating, clean, spacious and the equipment was very good. I liked the location. My accommodation was superb and. I would like to go back again next year! I liked mixing with other students from other countries and I also liked the fact that it was 100% french at the school and at my hosts home. Teachers were first rate and I learned a lot. I would definitely do it again. Having been a languge tacher myself (Latin, English, Spanish) I really appreciated the preparation of the teachers, and the variety of the materials presented. 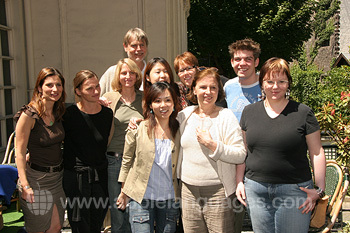 It was great fun and being fun for a three hour language class is not easy.